http://www.vitruviodesign.it/ ships products all over Europe. To guarantee his customers quick shipments it relies on the best express carriers selected according to the geographic region of destination and to the type of products. 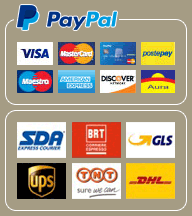 The products purchased on http://www.vitruviodesign.it/ are averagely delivered within from 1 (one) to 5 (five) days after payment’s receipt, by express courier, and in any case by and not later than 30 (thirty) days from the date the contract has been entered into as provided for by the General Terms and Conditions of Sale. The couriers generally deliver the products from Monday to Friday, from 9a.m. until 5p.m. o’clock, excepted the days which are holiday days in Italy. It is possible that a product which has been ordered is not immediately available, in this case Vitruvio S.r.l. will inform you by e-mail. In any case shipment of the purchased products will be carried out as soon as possible. Shipment and delivery costs are not included in the price of the product and are showed during the order’s processing. In order for you to follow the status of your purchasing order, Vitruvio S.r.l. informatics system produces at first a shopping bogie’s number, and then a purchasing order’s confirmation that you will see in all the correspondence you will receive from Vitruvio S.r.l.. In case you are registered in the Shop, following a specific procedure called the “creation of an account”, to check all the information concerning your purchasing order, you can enter the section “my account” by clicking on the link present on each page. After the products have been shipped, for the majority of the couriers used, it is available the on line function “order tracking”. As soon as the products go out from Vitruvio S.r.l.’s warehouse to be handed over to the couriers in charge of the delivery, Vitruvio S.r.l. will send to you an e-mail indicating the data necessary to carry out the order tracking. Shipments out of the European Union can be subject to customs tax or import duties. Any said amounts, determined when the Product enters into the country of destination, must be borne by the receiver, and are not included in the purchasing order total price.